Generations of composers have created a remarkable body of choral literature, inspired by the events in the life of Christ. 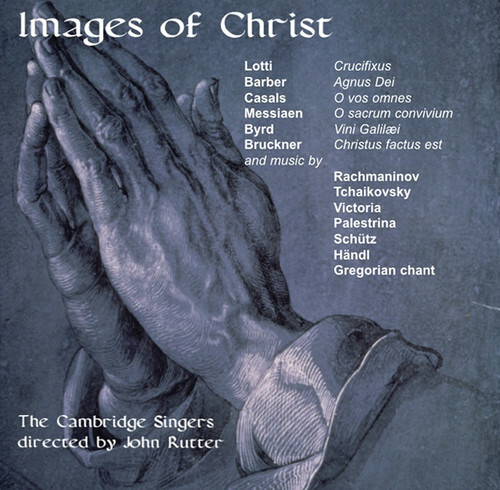 John Rutter directs the 29-strong Cambridge Singers in a cappella renditions of some of the most beautiful works from this body, divided into five groups. In the first group, "The Coming of Christ," we have pieces by E.C. Bairstow, da Palestrina and Handl, as well as a Sarum chant, "Veni, Redemptor gentium." In the second group, "Words of Christ," we find pieces by Heinrich Schutz, P.I. Tchaikovsky, Rachmaninov and Stravinsky. In the third group, "The Passion of Christ," we have works by Anton Bruckner, da Palestrina, T.L. de Victoria, Pablo Casals and Antonio Lotti. In the fourth group, "Resurrection and Ascension," there are pieces by Peter Phillips, da Palestrina and William Bird. And in the fifth group, "Christ in the Eucharist," we have works by T.L. de Victoria, Richard Dering, Samuel Barber, Olivier Messiaen and a lovely Gregorian chant, "Pange Lingua." The 24-page liner notes contain all words and translations. Let us find an imaginary place in the cathedral and hear the soaring praises to the remarkable man for whom it was built!